Jacob Norman3 reviews ★★★★★ 21 hours ago We love Massey Tuckpointing! They have tuckpointed all four of our exterior walls of our house at this point. They have also completely refurbished our wood-burning fireplace. 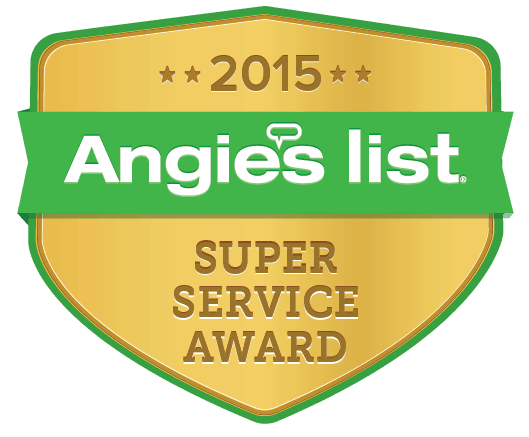 Their customer service is wonderful and the high quality of their work speaks for itself. Cannot recommend highly enough! Have You Ever Wondered If Those CSL Logs Work? Many of our St. Louis tuckpointing and chimney cleaning customers have asked us about the effectiveness of those advertised creosote logs, and their effectiveness in reducing or eliminating dangerous creosote buildup in their chimneys. The simple answer is, yes. A recognized chimney cleaning industry organization, The Chimney Institute of America, say they do, but there’s more to the story. Sole reliance on a creosote log to clean your chimney thoroughly is not wise. A creosote log is not enough to ensure a safe season of using and enjoying your fireplace. While a creosote log helps remove some creosote, there’s still creosote left behind. Creosote, as many homeowners already know, is a dangerous sticky, flammable substance that attaches to your chimney’s walls and chimney flue. While creosote chimney logs can help, they’re no substitute for a professional chimney inspection and thorough cleaning. While the log can help dehydrate the creosote and make it fall off easier, only a professional chimney inspection and cleaning can remove creosote to optimum levels. Creosote is not the only concern when it comes to your St. Louis chimney or fireplace. Animals, debris, bird nests, missing mortar, damaged flue liners, damaged or missing chimney caps, loose bricks, etc. can also lead to dangerous and costly chimney issues if they’re left unchecked. Don’t take chances with your home or your family’s safety, book a professional chimney inspector and chimney sweep for true peace of mind. The professional tuck pointers, chimney repair pros, and chimney sweeps at Massey Tuckpointing & Masonry have been serving St. Louis and the St. Louis Metro customers for decades. We know how to make sure your chimney is in optimum condition and working safely. Call Massey Tuckpointing & Masonry and schedule your professional St. Louis chimney inspection and cleaning. We are ready to serve you. Merry Christmas From Massey Tuckpointing. 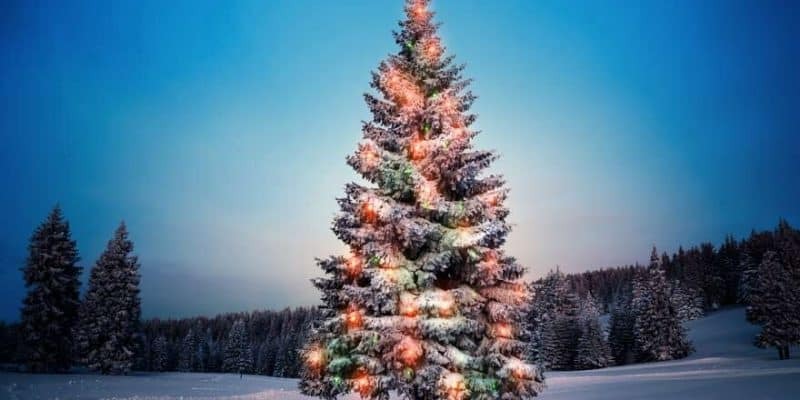 Massey Tuckpointing & Masonry, your source for the best in tuckpointing and brick repair, want to wish our customers, employees, friends, and family a Merry Christmas and Happy New Year. 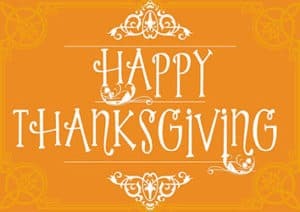 Happy Thanksgiving from your trusted St. Louis tuck pointers and masons, Massey Tuckpointing & Masonry. We want to take this opportunity to wish all of our customers, our hardworking employees, family, friends, and St. Louis neighbors, a Happy Thanksgiving. We will be back in the office this Friday and ready to help you with all your chimney cleaning, masonry, chimney repair, and St. Louis tuckpointing needs. It’s that time of the year—a time when the leaves turn beautiful colors, carved pumpkins abound, ghouls and goblins lurk, and there’s a crisp chill hanging in the darkness of night. It’s time to enjoy the warmth and beautiful light of a crackling fire. Before you light that first fire to take the chill off, ask yourself this question: “When was the last time I had my chimney inspected and cleaned?” If you can’t remember, or it’s been a year or more, stop! There is an average of 25,000 chimney fires in the US every year! Don’t be part of that statistic. Keep your family and home safe from chimney fires by scheduling a chimney inspection and professional cleaning. With each use of your fireplace, a sticky substance called creosote sticks to the inside of your chimney and chimney flue liner. Each time you use your fireplace, creosote slowly builds up and can increase the possibility of experiencing a dangerous, costly chimney fire. Sometimes, chimney fires are subtler and go undetected. They may cause cumulative damage that isn’t typically apparent to the average homeowner. Extreme heat and temperatures of as high as 2,000 degrees can be generated by these fires. At Massey Tuckpointing, your St. Louis tuckpointing pros, we know what to look for and how to properly and thoroughly inspect your chimney, flue liner, mortar, and other components of your fireplace and chimney system. We also are certified and trained in the art of chimney sweeping and attend continuing education to ensure our chimney sweeps and masons are the best they can be and deliver a superior level of service. Use our chimney cam to thoroughly inspect the entire stack for corrosion, cracks, missing mortar and more. 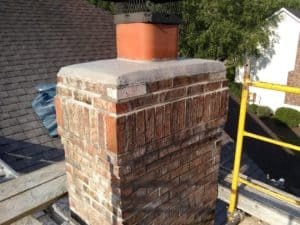 If our St. Louis chimney inspectors and sweeps find an issue or multiple issues with your flue liner, chimney cap, mortar, damper or any other element of your chimney and fireplace, we’ll find it, document it, and inform you of all issues and needed repairs. If our chimney inspection doesn’t reveal any issues, we get busy thoroughly and professionally sweeping your chimney and getting you ready to enjoy your fireplace all season long. Stay safe and enjoy the warmth of a toasty, cozy and romantic fire. Massey Tuckpointing, your trusted, family-owned, and trained masons, tuckpointers, and chimney sweep experts are ready to serve you and your tuckpointing needs.